Arrive in Kathmandu meet our staff and transfer to hotel in Kathmandu, join group meeting if you are joing with group and tour briefing, final payment, check equipment, overnight in Kathmandu. Day 02: City Sightseeing and preparation for trekking, overnight in Kathmandu (1340m) (BB). Guided city tour; after breakfast, 9 AM start our city tour. First we drive to Pashupatinath Temple, the Hindus pilgrims’ place where the death body burn. Second bring to Buddhanath stupa, which is one the biggest stupa in the world. Third, drive to Swayambhunath its call “monkey Temple” and at last visit Kathmandu Durbar Squire, the old “historical palace” 4-6 hours, Check equipments or shopping in Thamel, overnight at Hotel. Early morning flight from Tribhuwan International Airport (Domestic) Kathmandu to Tenzing Hillary Airport, Lukla. Upon arrival at the airport, your guide will brief you day trek, as well as introduce you to your porters. While your Sherpas sort out and load your trekking equipments, you have time to explore Lukla. After finish breakfast, to proceed from Lukla to Khumbu, head north, past a Chorten with praying wheels and join the main tail at Choplung (2696m) in less than one hour. The proceed from their head north crossing the Thado Khola (2554m) with the awesome trekking peak Kusum Khanguru (6483m) at its head. To reach Phakding (2640m), 1.30 hours from Chuplung or almost 3.30 hours from Lukla, overnight at Hotel. Day 04: Namche (3540m) - 5 hours trekking to Namche Bazar (B/L/D). Day 05: Namche Bazaar - Rest day for Acclimatization (B/L/D). Day 06: Tyangboche (3767m) - 4.30 hours trekking. (B/L/D). Day 07: Dingboche (4410m) – 5-6 hours trekking (B/L/D). Day 08: Lobuje (4900m) - 4-5 hours trekking (B/L/D). After breakfast, we start trekking climb over Dingboche valley 15-20 minutes. Over the hill with beautiful view of Tawache, Cholatse, Amadablam, Makalu, Island peak. Trek continues to Dukla 4680m, may we have lunch. From Dukla, the trail is ascending to Dukla/Dhukla pass 4800m where many memorials monuments who died in Everest summit. After the pass gragually heading to Lobuje. It takes 5 hours to Lobuje 4910m from Dingboche, Overnight at lodge. 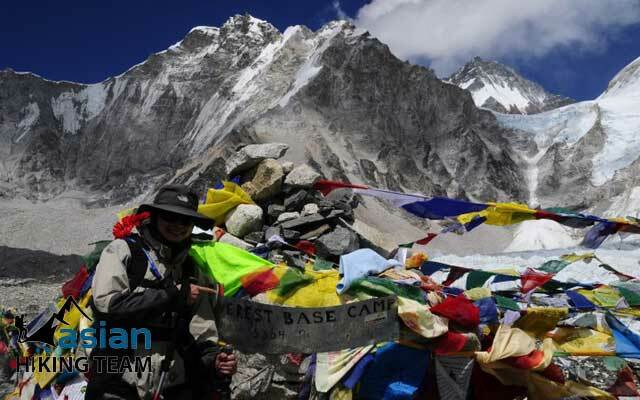 Day 09: Gorap-shep (5170m) – Everest Base Camp (5364m), 5/6 hours trekking (B/L/D). 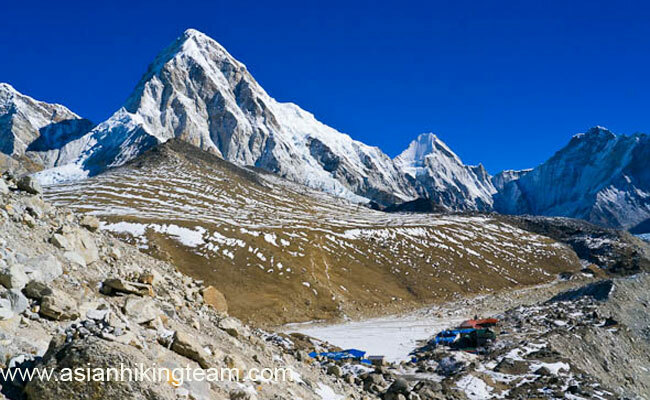 This is another big and difficult walk along the Khumbu Glacier and up to the Everest Base Camp (5365 m). Early in the morning leaving Lobuje, the trail goes over the glacier and moving rock. The distain is not far away however the altitude killing you so its takes 3 to 4 hours to Gorep-shep. 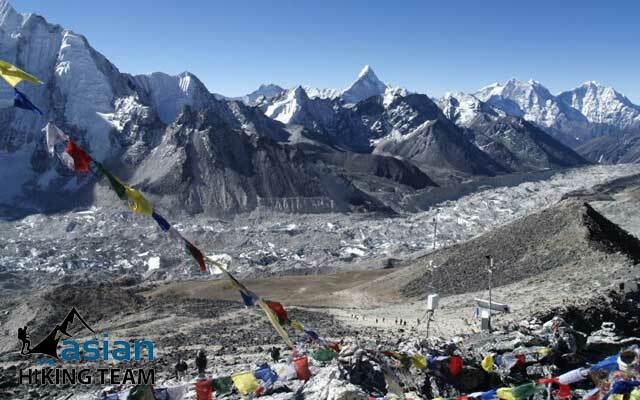 We will head up to Everest Base camp (5365 meters), and return to Gorak-shep at elevation of 5180 meters. 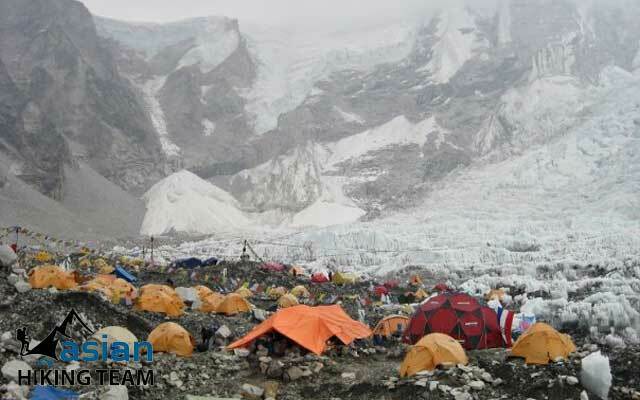 We are likely to see the teams of Everest Expeditions. The view of the Khumbu Icefall is spectacular. We then return to Gorak Shep for to spend our nights. We walk over the moving stone with jump so it does hard, be careful to walk 4-7 hours to/from Base camp , overnight at Guesthouse. 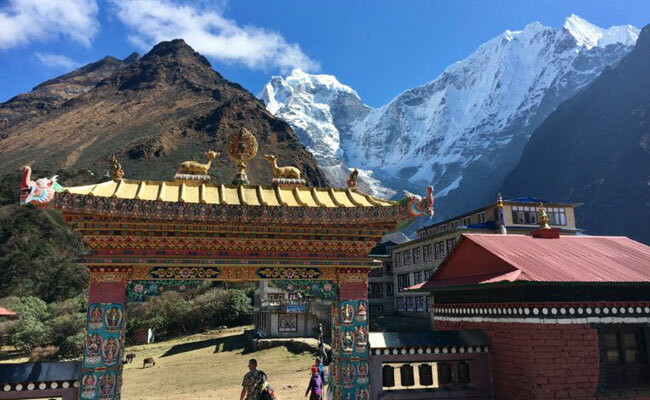 Day 10: Pheriche 4010m – 2 hours Kalapattar (5545m) climb and 5 hours trekking (B/L/D). Day 11: Khumjung (3870m) - 5 hours trekking (B/L/D). Today, start late because of hard trekking day in yesterday. Following down and up trail from Pheriche to Khumjug. 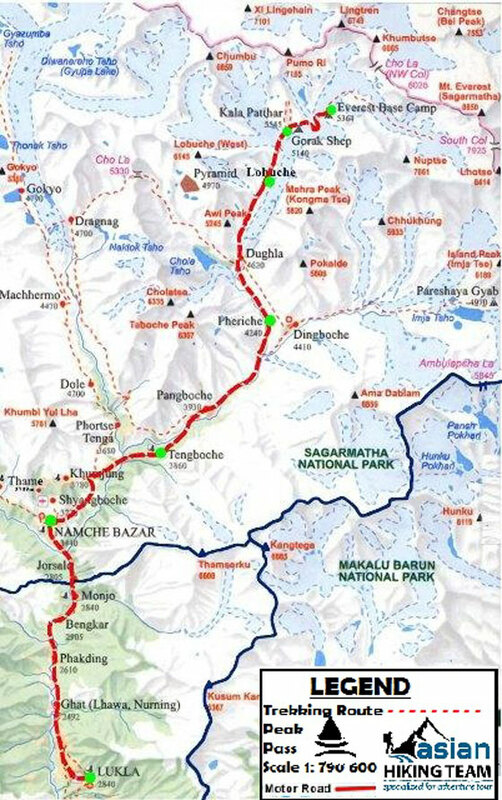 First 3 hours bring you down passing Pangboche, Deboche, Tyangboce and crossing bridge to reach Kangjuma and an half hour trekking to Khumjung valley 3870m, The trail also takes you to the area of the endangered Musked Deer, Himalayan Thar, and Pheasant Birds to the area of the Pine Forest, to the course of the Dudh Kosi River, and to the hills of the small villages5.30 hours, Overnight at guesthouse. Day 12: Phakding (2640m) - 4/5 hours trekking (B/L/D). Following up and down trail from Khumjung to Phakding. 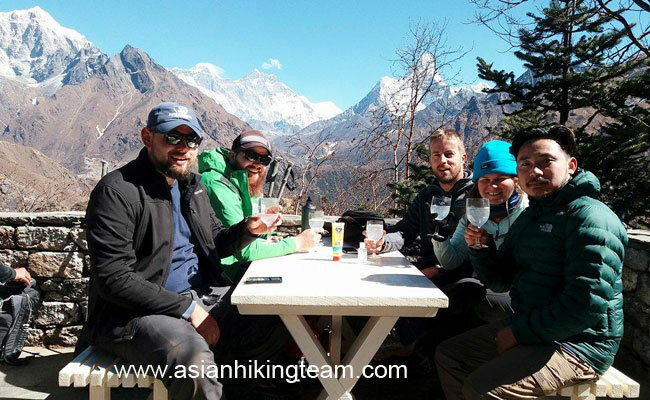 you enjoy the stunning view of Everest, Nuptse, Lhotse, and Ama Dablam. All the same way trekking to Namche Bazaar then same way returning to Phakding 2640m, 5 hours, overnight Hotel. Day 13: Lukla - 3 hours trekking (B/L/D). Finally, we return to Lukla from where we have started our trek. 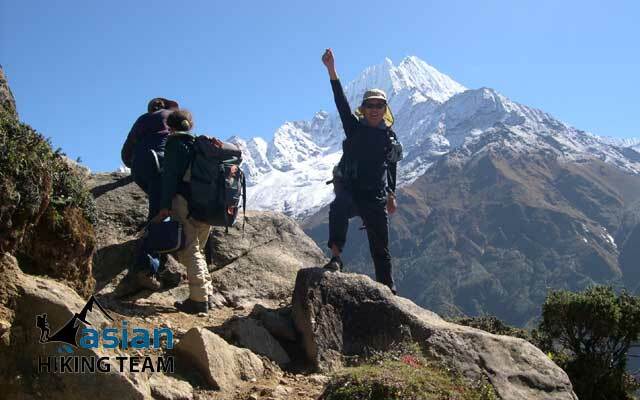 We would also like to share our trek achievements with other trekkers, as well as we would like to explore Lukla. 3 hours trekking, rest, final celebration day in mountain, overnight Hotel. Day 14: Kathmandu - flight to Kathmandu, finish trip (BB/L). Note: If you are interested in continuing on to Chitwan Jungle Safari, White Water River Rafting, Paragliding, Bungee Jump, Lets us know, Those programs need few extra days. Day 15: Spare Day in Kathmandu (BB). Today, the itinerary make one spare day in Kathmandu because of the domestic flight to/from Lukla is depending on weather. So if the flight is on time date and time, may we can use this day sightseeing in Bhaktapur or Patan or your own shopping or visit in Kathmandu. Day 16: Onward Journey - drop to airport or next trip (B). 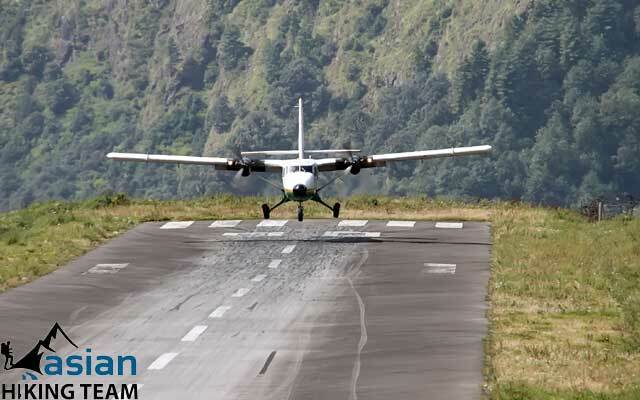 The trip end, our airport representative will drop you to the Kathmandu International Airport for your flight departure from Nepal or Next trip.